Thank you so much for all of the positive responses from all of you about the Colfax Dress and also the fabric that I made for the projects. 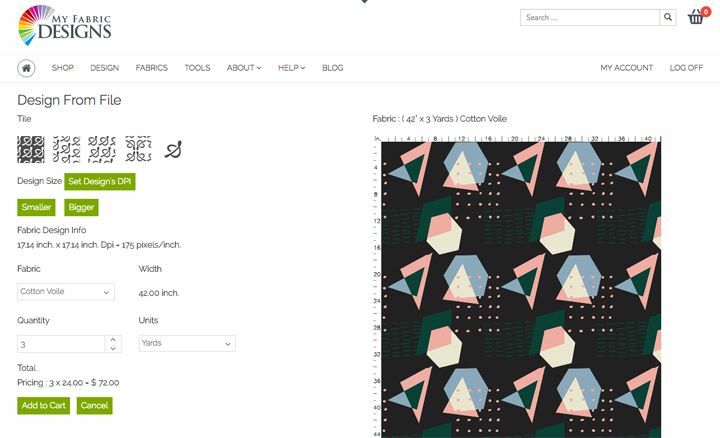 It’s been really fun working with My Fabric Designs for this launch and I wanted to put together a little post to show you how easy it is to make a repeating pattern using their design tools so that you can make your own fabric too. Creating a pattern that repeats evenly and seamlessly can be a tricky part of designing the fabric. You can do it all in photoshop or illustrator if you prefer. Here are a few youtube tutorials that helped me a ton when I was learning how to do it. Click here, here, or here for the videos or tutorials. Next you are going to need some images. I made up 5 different shapes or groupings of shapes in illustrator. These could also be something that you draw and scan into your computer. Or it could be online images that are stock or free domain. Whatever they are you need to save them as separately files. If you are going to be overlapping them or making a colored background make sure that the background of your images are transparent. I recommend saving them at 300 dpi and at a larger scale than you think you will actually print them. You can always scale them down when designing, but you can’t go bigger. 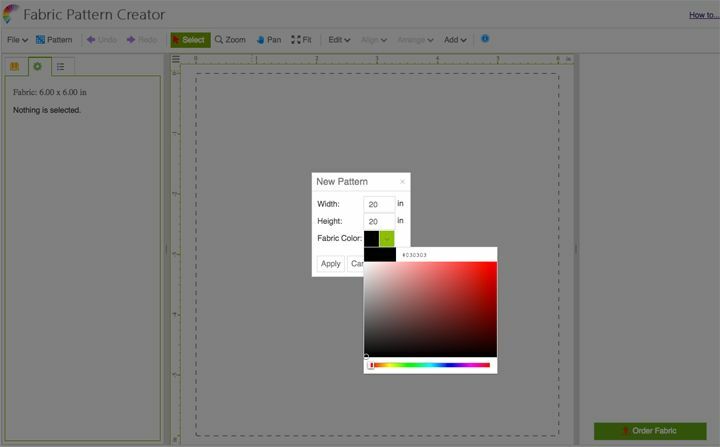 Now, go ahead and open the fabric creator. Click File / New and decide what size you want to start with. Go smaller like 6×6 inches if you want a small repeating pattern like you would use for quilting. I like mine larger so I chose 20×20 inches. You also select the background color at this time. I went for a black. Hit apply. The middle square will be the one that you work on (light gray background) and the right square will show your finished repeat pattern. Go to Add / Image and choose your first image to upload. It will drop it in the middle of your work square and show the repeat on the right. Cool right? Continue to upload all of your images. Move around the images and scale them. You will notice that as some of your images overlap the edge of the working square that they will create a repeat. The right square makes it really easy to see what your repeat looks like and where to place each object for the best visual affect. You can scale the images or rotate them with the handles on the outside of each object. You can call arrange them by sending them in front or in back of other images. Keep playing around until you like the way that the repeat pattern looks on the right. Once you are ready make sure you save your pattern to your desktop. Then click order fabric. This will bring you into the area where you can choose the type of fabric you want to print it on and how large you want your pattern to print (it can go down to 150 dpi). Then order your fabric. Make sure that you use the code TRUEBFS for free shipping on your order this month. I hope this tutorial made designing your own fabric a little less scary. I have had so much fun playing around with this tool. Just a reminder that My Fabric Designs is providing the prizes for the Colfax Sewalong Contest. So if you want to give it a try this is the perfect opportunity. Click here for more details.